Photography seems an ambiguous, immaterial sort of death, just an endless, unchangeable present, and gradually, by degrees, it is endlessly past. In an age otherwise so well documented the fact of our dying, its simple inevitability and its rituals, remain mostly unseen, our last real taboo, pushed to the margins. Perhaps with a medium so particular, so concrete, as photography it is naturally difficult to address states of transition, of departure and convergence, without the result being clumsy or overly literal, jumping at shadows. Of course, Mann is best known – notorious, even – for the series of pictures she made with her young family where they often appeared naked and in poses that displayed a strikingly adult sense of self-awareness. Seeing them on the cusp of losing youth, in dream-like scenes and private worlds she made the domestic a universal trauma, with an acute sensitivity to the kind of minute shifts that signal more profound changes. These pictures brought her acclaim and criticism in equal measure. At the time (and indeed still) such images of children were an especially divisive issue, but if Mann proved anything it is the sustained complexity of familial relationships, that the conventional wisdom describing our experiences won’t follow the same logic as at the borderlands where so often we find ourselves. Building this work for almost a decade she eventually moved on to other themes, those pale figures swallowed up by a wider landscape. 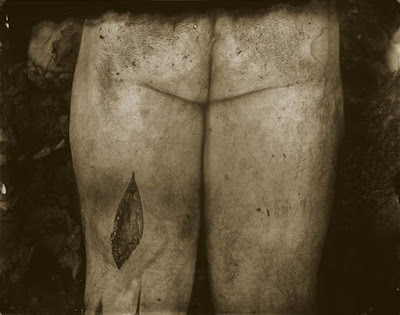 In the series What Remains, beginning with photographs of her dog’s bones and preserved skin, which is seen hanging from the wall like a discarded garment, she makes explicit what has always been an obvious undercurrent in her work – the narrow cord of life strung out across an expanse of unknowable darkness. Even in the earlier pictures of the children they seem menaced by forces that they cannot yet understand, but of which she herself is painfully aware. The development is not so unexpected or abrupt as it might have seemed at first. Rather, as with all of Mann’s work, it is rooted directly in her own experiences. 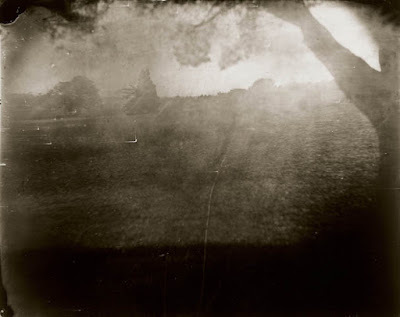 So after a convict had been killed in a shoot out with police on the family farm it was seeing where he had died, seeing his blood on the ground, that seems to have spurred her into photographing what are, quite literally, landscapes of death, in the form of Civil War battlefields. She is not so much telling the story of these places in any direct sense, or what happened there, (which would probably be impossible anyway), but calling up death out of living, material substance, communicating an uneasy, spectral presence through the pictures. 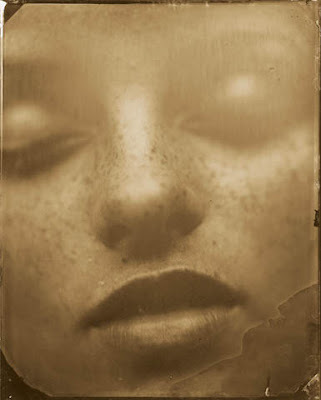 Its unpredictable nature and fragility mean the wet-plate collodion process she uses is perfectly suited to capture the atmosphere of such haunting places, their inner life, finding an ideal emotional register, veiled and secretive. 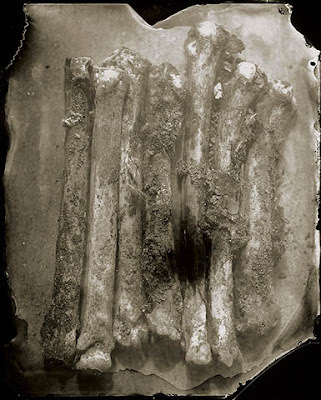 Appropriately enough, the collodion, a sticky, flammable substance, coated on the glass plates to form a photographic emulsion with silver nitrate, had at one time been used to bind open wounds by military doctors in the field – wounds, and the binding of wounds, opening the body of time, its hidden machinery, seeing what moves through its interior, a particular force, a displacement, leading back to the more conventionally grotesque spectre of bodily death, first in the architectural, but none the less poignant, photographs of her dog Eva’s bones, with teeth still embedded in the jaw, nails intact, then in a further series of images made at a forensic research facility run by the University of Tennessee, showing human bodies left to decay in the landscape, displaying an unseemly ripeness, like fallen fruit, splitting open. With brutal candour she reveals to us the absolute factuality of death, its process. In long exposures the furious activity of maggots is seen as a vaporous cloud, mouths gape, skin is drawn taut over bones, fat and organs putrefy, hair clings defiantly to the naked dome of a head – she spares us nothing. As a thief invading this hidden, silent world, she refuses to look away, refuses the dead a last, un-needed, dignity; Mann finds the anonymity of decay to be another kind of life, requiring only the proper understanding for what has been lost and how. She acknowledges the closeness of dying. Completing this cycle of work are some extremely intimate, demanding portraits of her own children, who once featured so prominently (if controversially) in the pictures she made. These portraits are on the edge of disappearance, a metaphorical, photographic death, implicit in every life and in every image. But their intimacy is obviously of a different sort when compared to what she has done before. Nothing is revealed; the living face becomes just another landscape, a shifting geography of possible selves, brought to rest at the long moment of exposure, but never still, the seemingly impossible intersection of present, past and future. She sees them (as a photographer of course, but as a mother too) growing away from her, growing into death, and absorbed into the broken surface of the images, their faces distorted by the lens, it seems as if no matter how closely we observe we can never get close enough, that something is always lost, something always goes unseen – this is the ruinous agency of time, and of forgetting. Photography is only ever proof, marking the inevitability of its own failure to cure our longing, to close wounds, and whatever else escapes the frame.